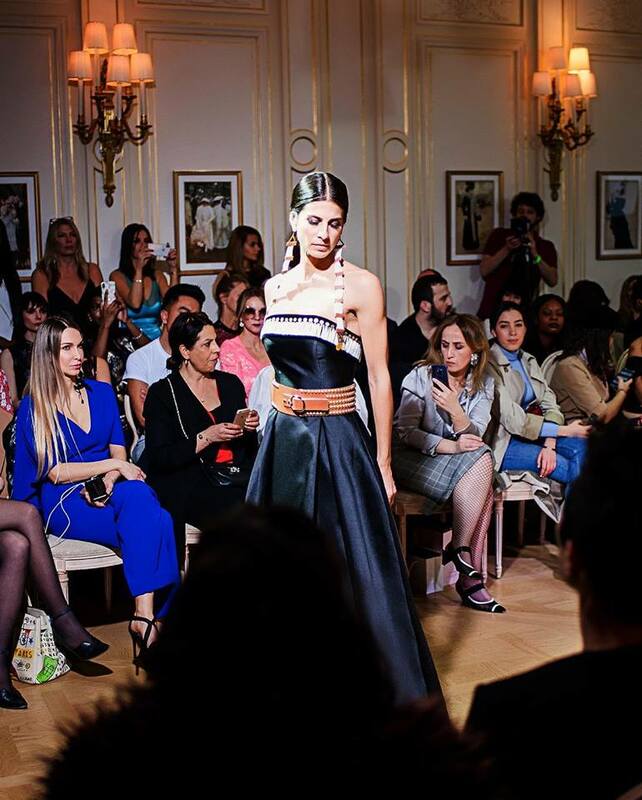 From a North Dakota reservation to the international runway, Norma Baker-Flying Horse debuts her latest collection in Paris during Paris Fashion Week last month. By Alison Oshel. Norma Baker-Flying Horse, a member of the Hidatsa tribe, lives on a reservation in North Dakota. From there she manages to create art that teaches worldwide audiences; art that speaks to human suffrage and the spirit to overcome. 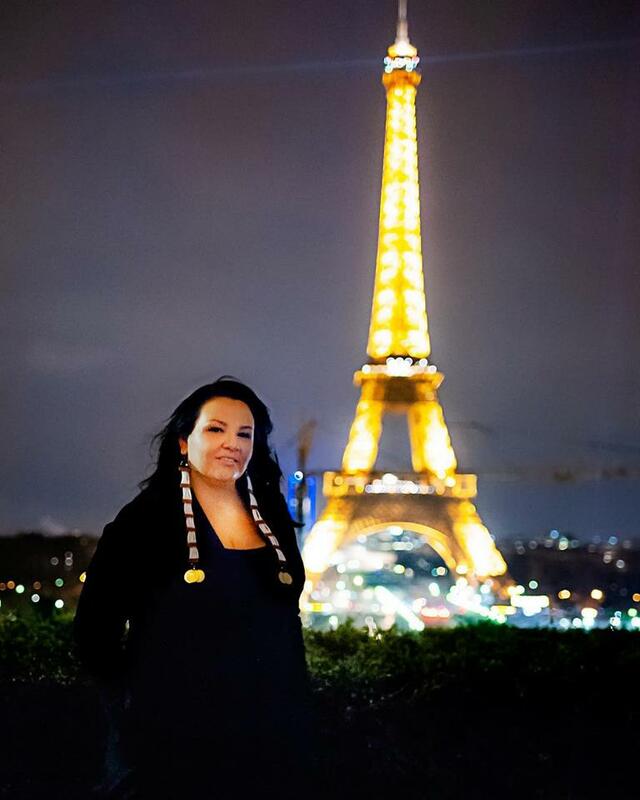 Norma, also known in her native tongue as Red Berry Woman, is creating couture fashion that was highlighted in the recent Paris Fashion Week. When asked why this work is important she explains, “The Native American culture was once punished for our regalia and it was taken from us and stripped and we want to bring that back. 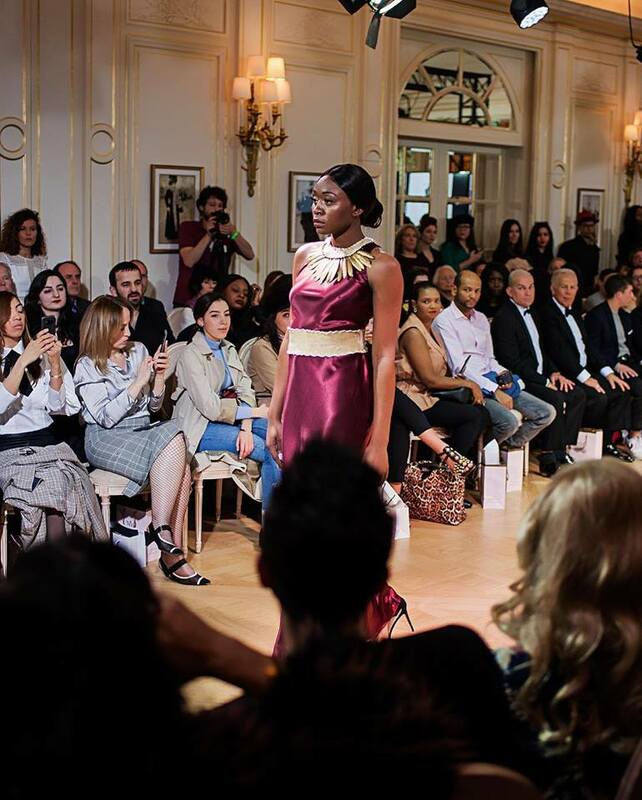 We are trying to find that balance in today’s modern fashion.” She noted that her choice to design formal wear is purposeful because it is used for special occasions much like the ceremonial costumes of native peoples. Native Americans have long fought cultural appropriation or cultural misappropriation as it is often called. Simply put, there is a balance needed when using feathers and beads in fashion design. 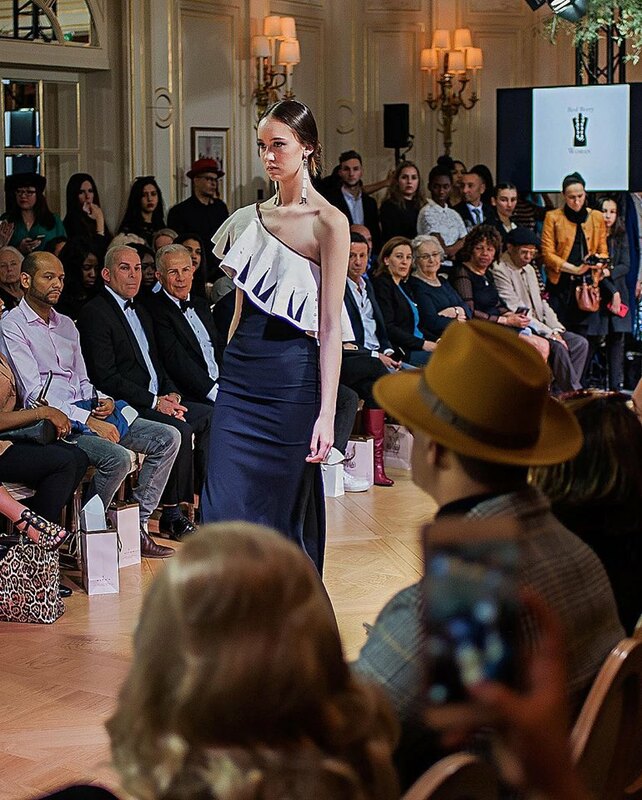 Since 2008, several fashion designers have made headlines in the industry by creating culturally sensitive design and the Native American fashion scene has been on the upsurge. Sourcing materials from a remote part of North Dakota is more laborious. “We are an hour’s drive from the nearest town. If I want to have anything unique, we have to shop on the Internet,” she says. Then she laughs and offers, “I don’t know why I keep saying ‘we’. It’s just me unless I count one of my kids.” Even though every gown is hand beaded, stitched or sewn by Baker-Flying Horse, she notably uses the pronoun “we” as she speaks of her one-woman enterprise but the reason for that is clear. She grew up with a grandmother who taught her to bead and a mother who taught her to sew. She and her husband and children dance pow-wow. Her brother-in-law makes the jewelry used in her fashion shoes which she also wears. She makes every effort to source the materials for her clothing line from other Natives. Her success, she insists, is the success of the greater Native American culture including the First Nations People of Canada. The jumpstart of her fashion career started when Miss Indian World asked Baker-Flying Horse to design ribbon dresses that she could wear for interviews and other public appearances. Just a couple of years later, activist Alice Bronotter wore a Red Berry Woman gown on the stage of the Academy Awards and Baker-Flying Horse thought she’d reached the apex of her career. 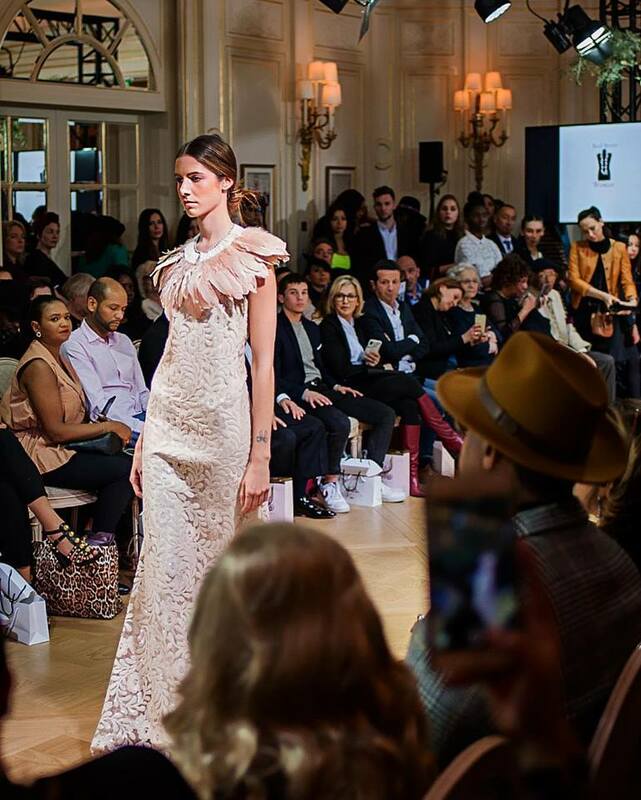 Since then she’s designed a gown worn at the Grammys and was invited to show a runway line for Vancouver’s 2018 Fall Fashion Week, her first international runway show. The Paris show went off without a hitch. One beautiful pink gown, made from a single piece of sequin lace folded and hemmed to fit the model, included a collaret of feathers attached to dentillium, a sea shell type of material traditionally used by her people as currency. Norma says she designed that dress as an homage to the host city, Paris—La Vie en Rose. “Oh, feathers!” came a cry from someone standing in the packed crowd at the Paris Ritz. But it was the good kind of cry–that which is intended to convey respect and gratitude. Norma and her husband walked the aisle after the show to a booming applause; he in a vest she designed for him. Afterward, she skipped the champagne reception and the two of them, instead, slipped away for dinner. It seems this lady has found her balance.